Then anybody can do it. Really, think about it. They are a really affluent society, who have never directly been involved in a war. They are Bankers to the world. They have no incentives what so ever. Yet here they are, for the good of the world. They deserve a postcard from the world that says, JOB WELL DONE! The Swiss voted on Sunday in favour of a massive overhaul of the country’s energy system by gradually replacing the power from its ageing nuclear reactors with renewable sources. A full 58.2 percent of Swiss voters supported the shift, according to a final tally after Sunday’s referendum, with only four of the country’s 26 cantons voting “no”. “This is a historic day for the country,” Green Party parliamentarian Adele Thorens Goumaz told public broadcaster RTS. The move has been in the making since shortly after Japan’s Fukushima nuclear plant was destroyed in the March 2011 tsunami disaster, when the Swiss government decided to gradually close its nuclear plants. Attempts to generate electricity from tidal and river flows has had some success. People that tried to generate electricity from ocean waves have struggled. They may be on the edge of real change and I find that to be exciting. It’s 1974. A man stands on the Scottish coast and stares out to sea. His dark hair is ruffled by the wind, while his mind is fixed on a new, pressing problem: How can all the teeming, crashing power of the ocean be harnessed to produce electricity, in a world that has just discovered it can’t rely on cheap oil forever? That man, and his colleagues, are still searching for the answer. For four decades, the problem of how to create an economically viable business producing power from waves has fascinated a specialized group of engineers, many of whom are concentrated around the sea-beaten coast of Scotland. Inventors have created all sorts of strange and wonderful devices to coax energy out of the water; investors have poured millions of pounds into the effort. The problem is arguably one of the most perplexing in energy production. And maybe, just maybe, the answer is getting closer. Sure everybody in power down there says it was a robbery gone bad but she was assassinated. I mean the cops that were suppose to be guarding her were guarding the wrong house blocks away in another neighborhood. Damn those damn dams. Berta Caceres, who won the 2015 Goldman Environmental Prize, has been shot dead at her home in the town of La Esperanza. Honduran environmentalist leader and winner of the 2015 Goldman Environmental Prize Berta Caceres has been shot dead at her home in the town of La Esperanza. Caceres was killed early on Thursday by two assailants who broke into her home, a member of her group, the Indian Council of People’s Organizations of Honduras, said. “Honduras has lost a brave and committed social activist,” fellow activist Tomas Membreno said in a statement. She had previously complained of receiving death threats from police, soldiers and local landowners because of her work. Activist Carlos Reyes described the assassination “a political crime by the government”. Go there read. More next week. No real comments here except the sponsor is the government and the number of participants are huge. The U.S. Department of Energy has accepted 92 teams from industry and academia to compete in its Wave Energy Prize program that seeks to encourage the development of wave energy conversion devices. The program, which was introduced in April by the DOE Office of Energy Efficiency and Renewable Energy during the National Hydropower Association’s Annual Conference in Washington, D.C., is a design-build-test competition that supports the department’s goal of making marine hydrokinetic generation more competitive with traditional forms of production. Teams will be competing for a total prize purse that totals more than $2 million. “We’re extremely pleased with both the quantity of teams and the diversity of participants reflecting broad expertise from so many established companies in the ocean energy space, universities, and newcomers to the industry,” said Julie Zona, Wave Energy Prize administrator. Since registration for the program closed June 30, teams are working on the first requirement for the prize — a technical submission describing their concepts, which is due later this month. A panel will then select up to 20 of the top teams by mid-August, with those groups invited to build a 1/50th scale model for small-tank testing. So here is a graphic that I borrowed (eh hum) to show the folks that read here how Illinois could swith to clean energy. But do Illinois leaders have the smart to do it? I do not know, but we shall find out. By the way I tried to put the graphic directly up here but you know I am technologically challenged so just follow the link. The OIL Drum goes offline – Does that mean that Peak Oil Theory is wrong? That is a very interesting question. At one level is is just a case of a bad attribution. It would be like saying if Jane’s stopped publication then there are no airplanes. At another level, as all the authors say that were involved, they may have just run out of new and bright things to say. It could also be that with many other things predicting the END OF THE WORLD, when it never happens, the readers got bored. That several major religions have preached that for thousands of years and nobody has gotten bored yet would speak against that. I have always been skeptical about the doom and gloom nature of the blog itself but when the CIA and the Defense Department believe something then, you have to believe it has some credibility and really oil is a finite resource. So with deep water drilling and fracking we may just be buying time. Then there is global warming. Anyway I drivel on. Following on my recent post bidding Farewell to The Oil Drum, I’d like to have a look at what I view as our longer term future for energy production and consumption. As noted in my previous post, for the time being the combination of unconventional oil extraction and the ramping up of extraction of natural gas (from both conventional and unconventional sources) has continued to push the point of peak oil production out into the future, defying the predictions of the more pessimistic peak oil observers. During this period we have seen a boom in the research and development of solutions to help us eliminate our dependency on fossil fuels, which I’ll explore in this post. The graphic below shows the energy available from renewable energy sources annually compared to global energy consumption. The numbers are intended to give a rough idea of relative scale – for any given energy source a wide range of estimates can be found in the literature so the numbers are indicative. 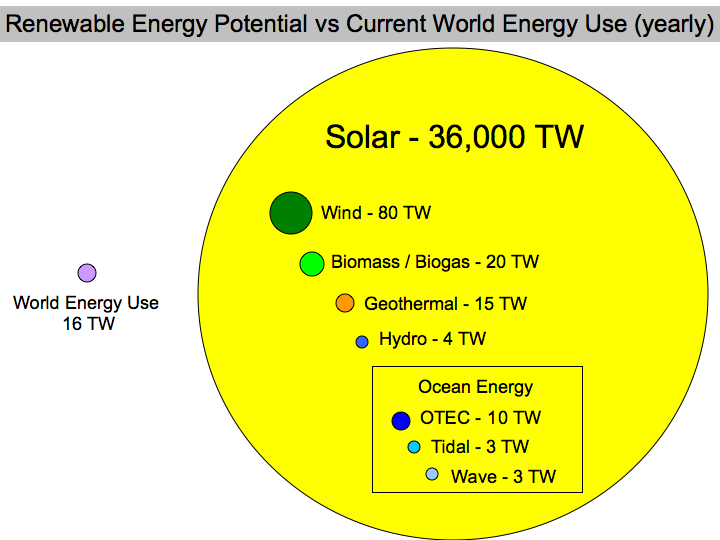 These numbers in some ways understate the amount of energy potentially available (ignoring solar power potential at sea or in space, for example, or wind power at high altitudes or far offshore, or geothermal power deep below the surface of the earth) but still serve the demonstrate that the renewable energy available to us is orders of magnitude larger than our current global energy consumption. The contribution made by renewable energy to our energy needs is expected to exceed that made by gas (and double that made by nuclear power) by 2016, though progress needs to be accelerated if we wish to create a sustainable energy system. Solar power is the largest energy source available to us, dwarfing all other sources – renewable and non-renewable. 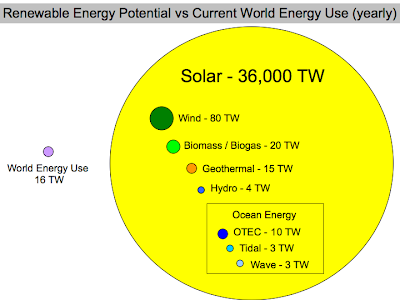 Approximately 36,000 Terawatts of power could be captured by land based solar power generation – compared to current global energy use of around 16 TW. As a result, most of the plans floated for shifting to 100% renewable energy (examples include proposals by Mark Jacobson and Stuart Staniford and local plans for countries like Germany and Australia) rely primarily on solar power. Solar power is not only the largest energy source available to us but it is also the fastest growing energy source, with solar power generation increasing by over 58% in 2012. There are a number of options for harnessing solar power – power generation using solar photovoltaic (PV) cells and solar thermal arrays along with passive solar techniques such as solar hot water heaters. I have been of the view that solar thermal power generation (also known as concentrating solar power or CSP) would become our most important source of power in the longer term. This view was based on a number of advantages that solar thermal possesses – it does not require rare or expensive materials (enabling it to scale without hitting resource limits), it can be built on (and is best suited to) arid land that has few other uses, it can incorporate energy storage (thus avoiding the intermittency issue), it is compatible with the existing centralised generation model and it can be combined with traditional sources of power generation (coal or gas) in hybrid power plants that allow an easy transition using existing connections to the electricity grid. An area of desert around 250 km by 250 km covered with solar thermal power generation could supply all the world’s current electricity demand. Go there and read a really long article. More next week. They say nothing about storms or ship traffic so I am not sure how this would work in the real world. Not to be confused with what could be the biggest storm ever to hit the United States, SUNdy – a large-scale offshore solar farm concept by global consultancy and certification firm DNV – was unveiled at Singapore International Energy Week on Thursday last week. The core feature of the floating solar concept is a hexagonal array of 4,200 solar panels – roughly the size of a football pitch – which floats on the sea’s surface. The ‘solar island’ would be capable of generating 2MW of power, with multiple islands joined together to create an offshore solar field of 50MW or more, producing enough electricity for around 30,000 people.